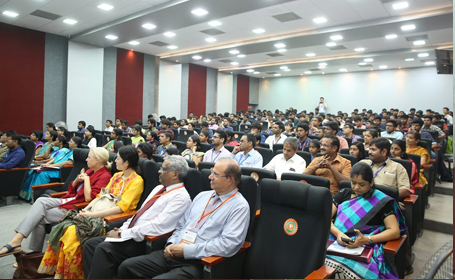 One day International Seminar on Role of International Languages in Higher Education (ISRIL’18) was organized by Department of Languages, Hindustan Institute of Technology & Science (HITS) in collaboration with ELT@I, Kancheepuram (HITS) Chapter. The event was held on 16th February 2018. 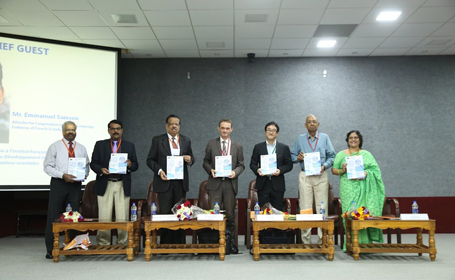 The International Seminar, which brought together prominent Academicians and Linguists from across the country and abroad, saw deliberations and Panel discussions on Role of International Languages in Higher Education. 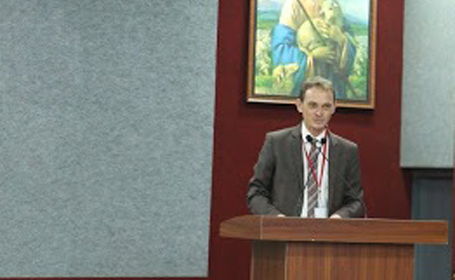 The inauguration of the Seminar was held in the morning session. Dr. Akkara Sherine, HOD, Languages and Convenor ISRIL’18, welcomed the audience on behalf of the Management and Dept. of Languages. She expressed her happiness that 140 participants and delegates from institutions across India and abroad had travelled from afar to be a part of this unique international seminar. 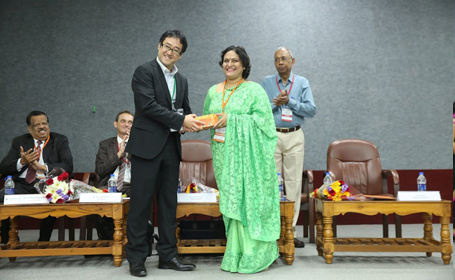 She extended her warm welcome to the Chief Guest, Mr. Emmanuel Samson Attaché for Cooperation in French Language, Embassy of France in India Guests of Honour, Dr. P. N. Ramani Chief Academic Officer, Akara Education Chennai Vice-President, English Language Teachers Association of India Chapter & Mr. Jun Arisue Sensei Japanese Language Advisor, Japan Foundation New Delhi (South India). 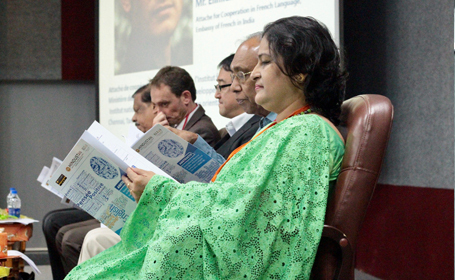 She informed the objectives of this seminar, was to bring together language experts, academicians, research scholars and staff members of various institutions to share their views and importance of International Languages and its scope in Higher Education. To enhance the excellence, and consistency of language in Higher Education and also to encourage the participants to witness a conglomeration of Foreign Language teachers, students and research scholars and to discuss the role of four different languages (English, French, German, Japanese and Spanish) in Higher Education and the scope of employability for students mastering foreign languages. Dr. S. Ramachandran Vice - Chancellor, Hindustan Institute of Technology & Science in his inaugural address appreciated the title of the international seminar and stated that , “ Language plays an important role in the growth of intelligence, indulgence, culture and personality” In his Address by Guests of Honour Dr. P. N. Ramani Chief Academic Officer, Vice - President, English Language Teachers Association of India (ELTAI) praised the organizers for bringing together participants of different international languages in one platform and he said that it is a herculean task. He appreciated that 140 participants, including students (National & International), research scholars, and faculty members from schools, colleges and universities attended the seminar. 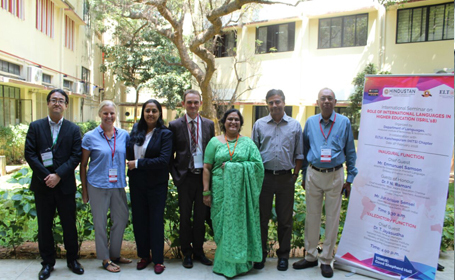 He briefed about the establishment and the role of English Language Teachers Association of India. He mentioned that he was happy to note that Dr. Sherine, ELTAI Kancheepuram Chapter Head has organized this unique International Seminar. 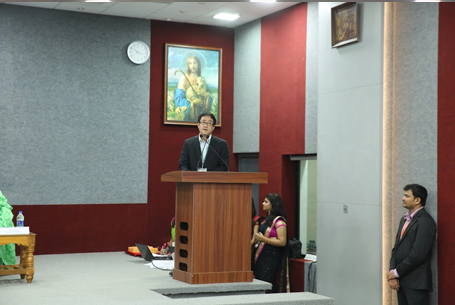 Mr. Jun Arisue Sensei Japanese Language Advisor, Japan Foundation, New Delhi (South India) in his address briefed about the importance of Japanese Language among engineering students. He said that learning Japanese is not only important in the field of business but it is vital to know the culture. In his Conference Keynote Address by Chief Guest Mr. Emmanuel Samson Attaché for Cooperation in French Language, Embassy of France in India informed the audience, “Utilize Technology and break the barriers in learning Foreign Languages in classroom” He also emphasized on incorporating skills oriented teaching to be a global citizen since the international languages enhances employability prospects and provides a platform to learn and imbibe other cultures”. 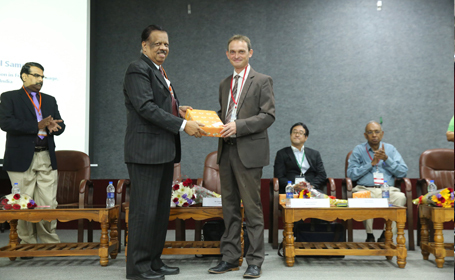 Samson addressed the students and informed that there are several French companies across India and students should learn French beyond A1 level to master the language. 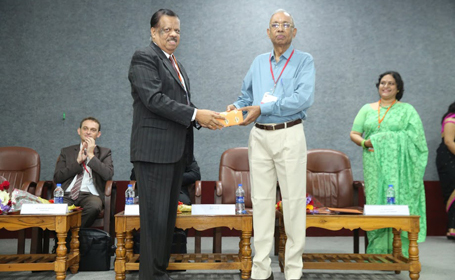 The Chief Guest released the Abstract Volume of the presenters and the first copy of the volume was handed over to Dr. Ilavazhagan, Director Research, HITS. Dr. Ramesh Babu HOD, Science & Humanities, HITS proposed Vote of Thanks. 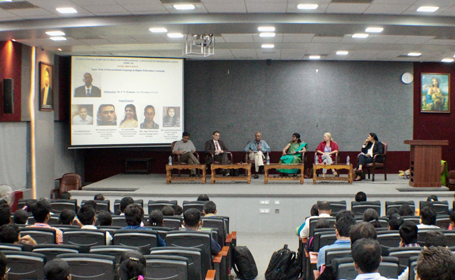 Panel experts for the Panel discussion comprised language experts of French, Mr. Samson, Dr. Rajesh Kumar, Prof. IIT, Dr. Jayasudha, Deputy General Manager, National Instructional Media Institute Ministry of Skill Development and Entrepreneurship (Government of India). Ms. Inge, German Language specialist, Ms. Sofia Khandelwal, Spanish Language expert. 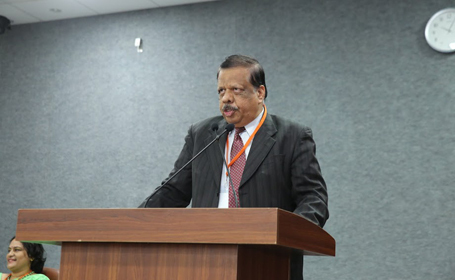 Dr. P.N.Ramani, ELTAI Vice-President moderated the session. Ms. Jaysudha,Manager, National Instructional Media Institute Ministry of Skill Development and Entrepreneurship (Government of India), was the Chief Guest during the valedictory function she presented 7 Best Presenter awards and Three Best Papers were also given.